I finished the CSB Expander book yesterday. 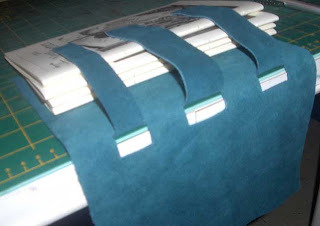 After this type of book is finished, more sections can be easily added. So, since that is the purpose, I decided to use this structure to bind some of my CBBAG newsletters. I'll be able to add subsequent newsletters later. 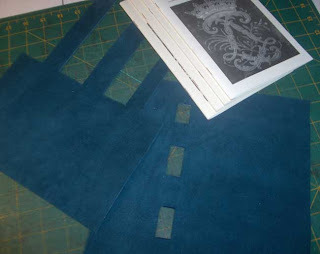 Similar to the CSB Linked, this structure has the two cover pieces crossed before the sewing is started. So one cover has strips, the other has holes to put the strips through. Ready for sewing. Each section is sewn individually. This is what makes it so functional for later expansion. Since the sections are not connected to each other, new sections can be added anywhere - front, middle, back, whatever. 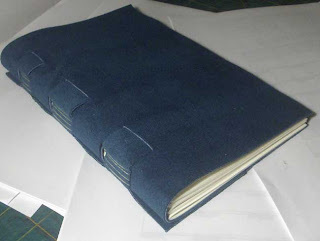 Finished sewing, strips visible inside the cover. Another neat and tidy structure, and very functional. 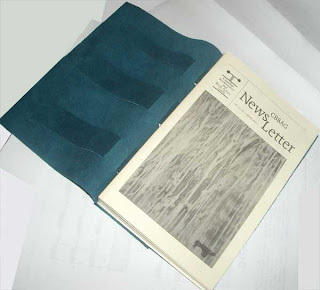 Now my CBBAG newsletters are way stylish in their teal suede covering.